For most people, if the weather is hot, ice cream sounds like a great idea. If you’re like me, ice cream sounds like a great idea regardless of the weather. 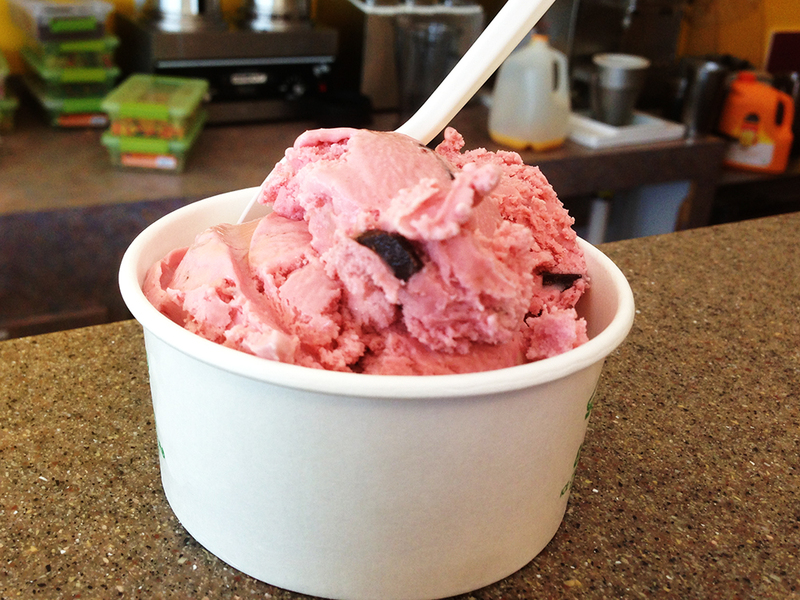 Over the summer I made the rounds and tried ice cream from old favorites to new shops I’d never tried before. 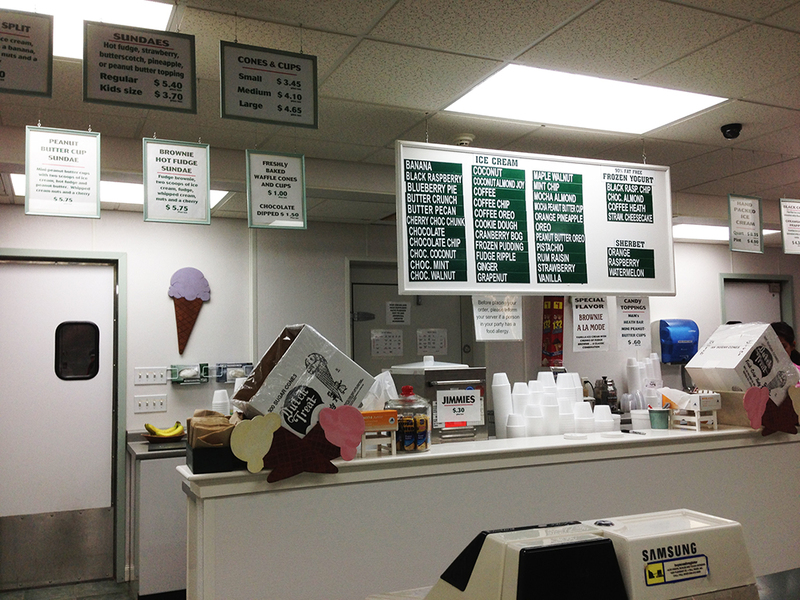 This post highlights three local businesses of note (in no real order) for quality frozen treats that everyone must try. Somerset Creamery, PVD Pops, and Emack & Bolio’s. 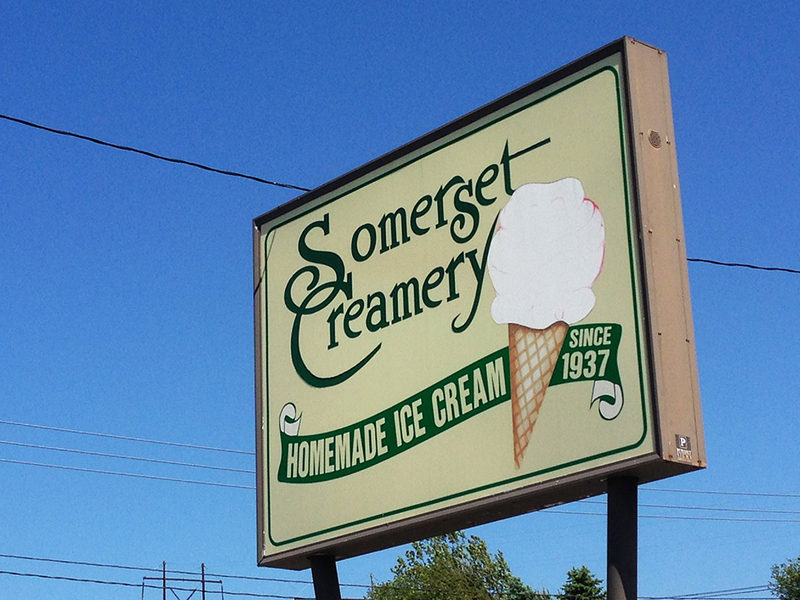 Growing up, I remember Somerset Creamery as a rarity because the business only opens for the summer. It’s a family owned business that’s been passed down since 1937. When I was a kid, the only store they had was on Route 6 in Somerset, but the business has since expanded to three stores (two in Somerset and one on the Cape). All of the ice cream is homemade using old fashioned techniques that result in rich, creamy, ice cream flavors. 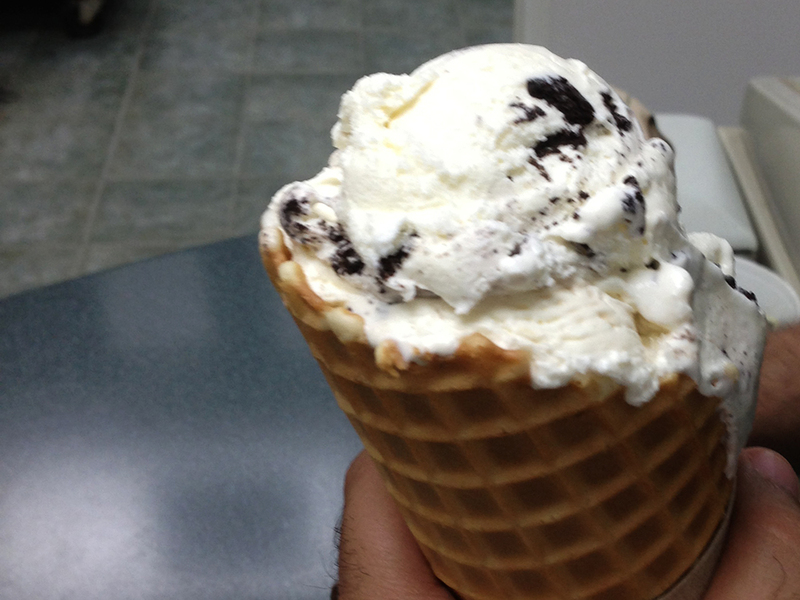 My personal favorite from Somerset Creamery is the Rum Raisin in a plain cone. Why a plain cone? 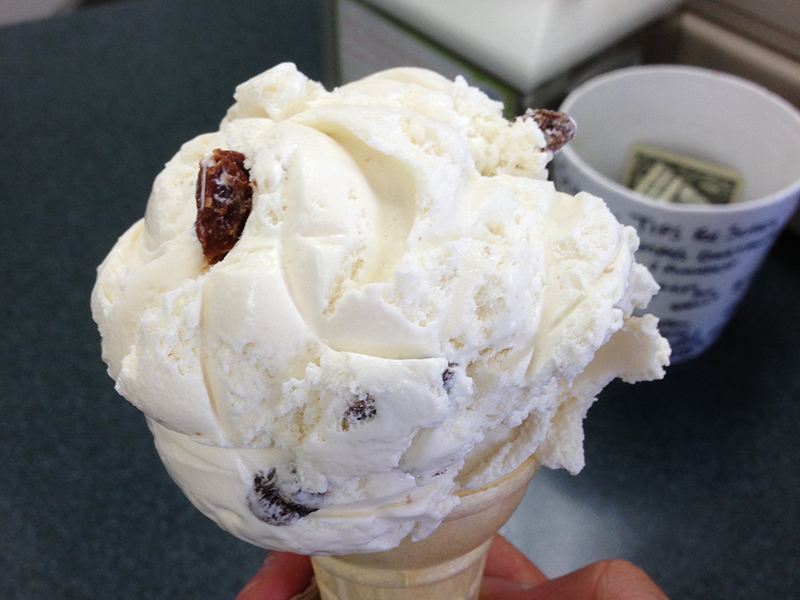 I’m not sure, but ever since I was a kid, I liked plain cones with my rum raisin ice cream. Give it a try. Somerset Creamery also has a ton of other flavors. For example, their mint chocolate chip is made with real chocolate chips instead of mint shavings. They also have special blends that mix nuts with fruit combinations like their signature Cranberry Bog Ice Cream® or their ridiculously chunky cookies and cream (below). Once especially great fact about Somerset Creamery is that their waffle cones don’t just smell amazing, they also taste as good as they smell. That might sound like an obvious observation, but from my experience, just because the delicious smell of waffle cones might permeate an ice cream shop, it doesn’t mean that the waffle cones taste good. I learned that disappointing lesson while eating a waffle cone bowl at a very well known ice cream chain. They smell wonderful, but the taste falls short. That isn’t the case at Somerset Creamery where the waffle cones add a crispy, buttery, and sweet dimension to any ice cream flavor. Trying PVD Pops was a first for me this year when I visited Providence Flea (a new flea market in Providence held on weekends). They don’t have a traditional store for selling their products, but rather go the way of the mobile popscicle stand. After facing the oppressive New England Summer humidity, I needed something to cool off and the PVD Pops stand was at the right place at the right time to help me out. They don’t have a lot of different flavors, but instead choose to focus on making a few really well. 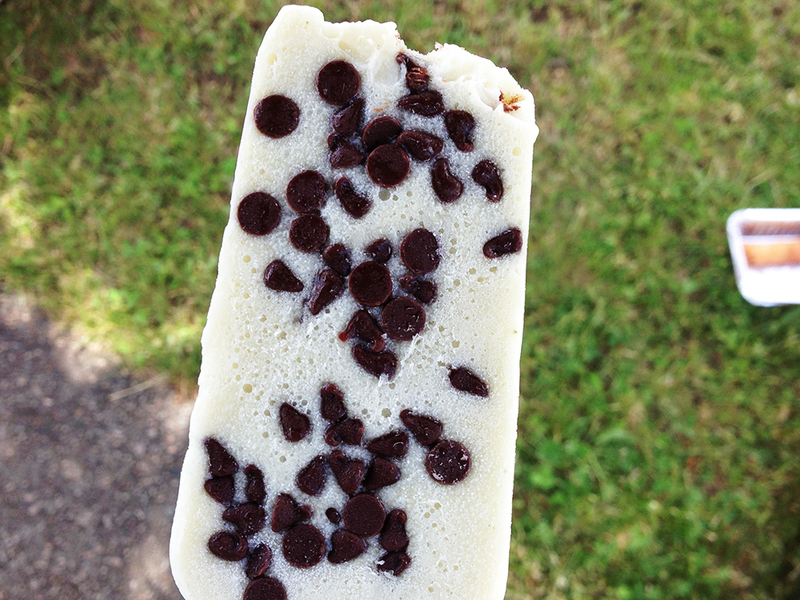 Their standard flavors are: “Classic Chocolate, RI Coffee Milk, Berries n’ Cream, Mint Chocolate Chip, [as well as] seasonal fruit and experimental flavors throughout the … season.” I tried the mint chocolate chip for my first PVD Pops experience. One of the first things I noticed about the PVD Pop aside from the refreshingly cold frost was the ingredients list. 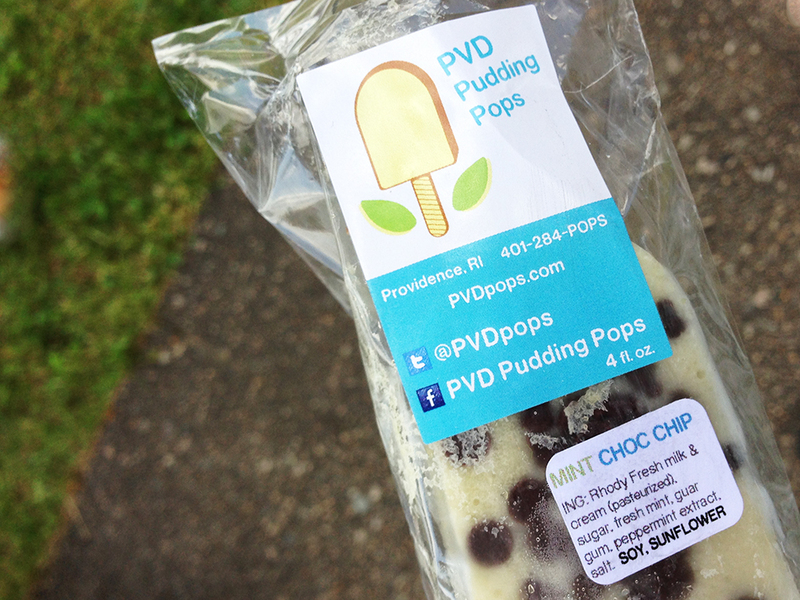 PVD Pops proudly uses locally sourced Rhody Fresh milk and cream. They also try to use other local and seasonal ingredients when possible. PVD Pops is a local business that supports local business, which makes it one of the rising many to subscribe to the “eat local” wave washing across America. The pop itself actually did taste creamy and minty, but still very light. They also use real actual chocolate chips in the mint chocolate chip, which broke up the texture at points, but not overly so. If you like popsicles, then you’ll really enjoy one of these local inventions. During college, I used to live about two small blocks away from the Emack & Bolio’s on Beacon Street. 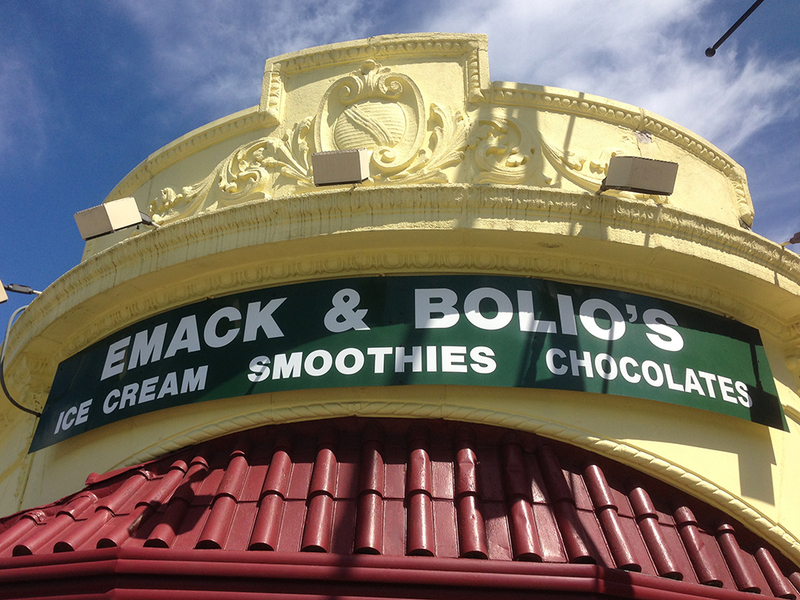 It wasn’t until I was about to move away that I finally gave Emack & Bolio’s a try. I confess that the main reason I never tried their ice cream was their name. I thought it was a terrible name for an ice cream shop and I judged the shop by its cover. After trying Emack & Bolio’s I learned two things: 1) never judge a shop by its name; and 2) they make some of the best ice cream I’ve had. 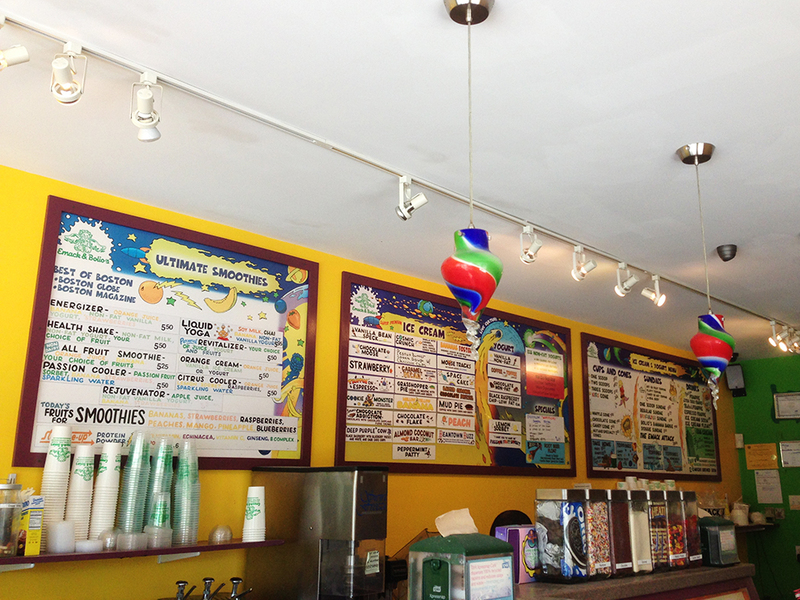 When you walk into any Emack & Bolio’s you’ll immediately find a quirky interior filled with psychedelic colors, cartoons, and child-like displays. The main reasons for this image stem from the shop’s roots as starting during the height of classic rock and hippies in the 1970’s. One especially fun fact that hits close to home is that the founder of Emack & Bolio’s, Bob Rook was a music lawyer. He started the shop as an after-hours location for musicians to satisfy their munchies with homemade ice cream when the clubs closed. Among their fancifully named ice cream flavors, my personal favorite is the “Deep Purple Cow,” which is black raspberry ice cream mixed with chunks of blueberries, with white and dark chocolate chips. Normally, I don’t like white chocolate, but it does go really well with ice cream when the flavors are fruit-based or dark chocolate based. The white chocolate adds a creamy element that doesn’t stick out rudely as white chocolate. This black raspberry isn’t sorbet/sherbet-like at all. Instead, it’s rich, creamy, and decadent. Find one of their rapidly spreading chains and try some any time of the year! If you’re looking for a taste of local homemade tradition and you’re near Somerset, MA or Cape Cod, then try Somerset Creamery. Go early or late in the summer, but don’t let the lines deter you. It’s worth it and the lines move quickly. 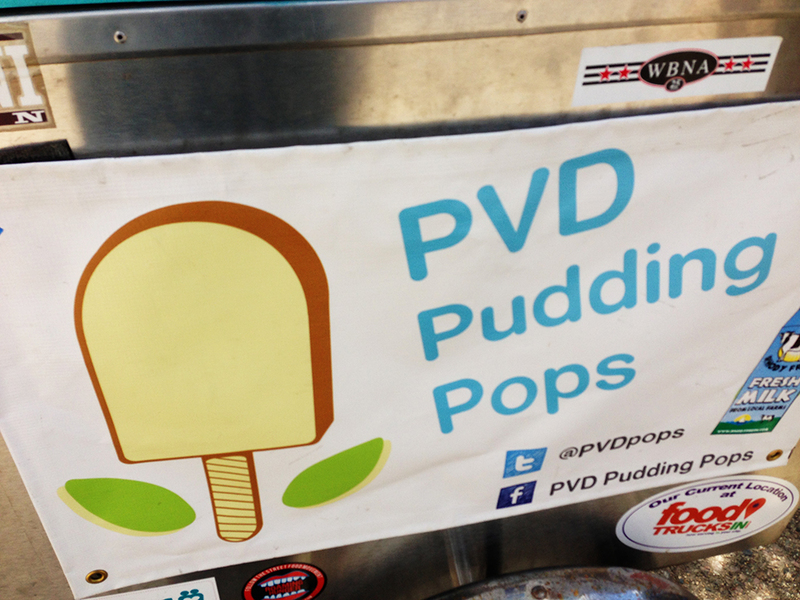 If you’re in RI and need a quick frozen fix on the go between May and October, then give PVD Pops a try. If you’re in the Boston area (among other states), then stop into Emack & Bolio’s over some other more well known chains for a unique experience with ice cream. Thanks for agreeing with my year-round ice cream views! If you’re ever in this part of the world, there are some good eats waiting for you! There may even be some fun non-food-related things to do as well, but you didn’t hear that from me! Hahaaa…! The non-food-related things are always secondary. Always. I think I need my own personal food truck!